The following post uses as references: Bloomberg Business, National Council on Higher Education, The Business Insider, and The College Board. May 7 (Bloomberg) — A group of bankers that advises the Federal Reserve’s Board of Governors has warned that farmland prices are inflating “a bubble” and growth in student-loan debt has “parallels to the housing crisis. “Recent growth in student-loan debt, to nearly $1 trillion, now exceeds credit-card outstandings and has parallels to the housing crisis,” the council said in its Feb. 3, 2012, meeting. The trend has continued, with the Consumer Financial Protection Bureau saying in March 2012 that student debt had topped a record $1 trillion. I was extremely surprised when first reading this statement published in Bloomberg Business. That surprise lasted about ten seconds. My wife and I put three boys through college; Mercer University, Tulane University and the University of Georgia. Even though they worked and had scholarships, the cost of a university education, even ten years ago, was daunting to a working engineer and his working wife. I can categorically state the cost of tuition for our three increased between three (3) and ten (10) percent each year depending upon the school. Have you purchased textbooks lately? Our youngest son had a book bill approaching $600.00 one semester. He was an undergraduate. Absolutely ridiculous. Of course this is not to mention lab fees, parking permits, mandated university health insurance and a host of other requirements the universities levied upon students and their parents. The chart below will indicate the increases by year. As you can see, these numbers are for public colleges. 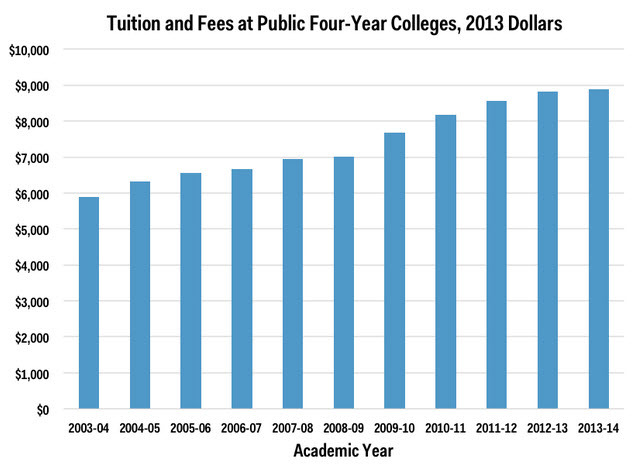 The next chart will indicate tuition and total costs by region for two and four year colleges both public and private. Seven in ten (10) seniors (69%) who graduated from public and nonprofit colleges in 2013 had student loan debt, with an average of $28,400 per borrower. 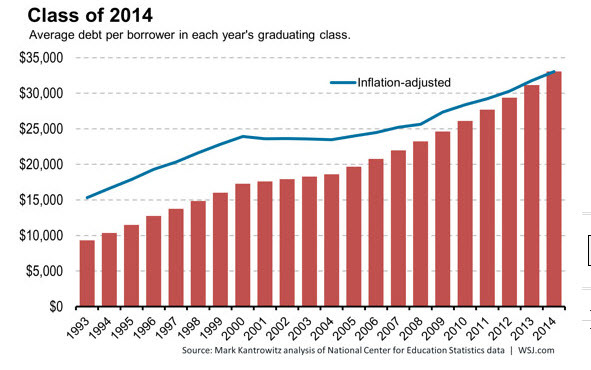 This represents a two percent increase from the average debt of 2012 public and nonprofit graduates. The map below indicates graphically the problem by region. 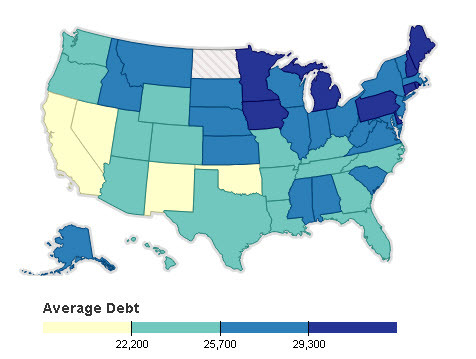 The twenty (20) high-debt public colleges had an individual average debt levels ranging from $33,950 to $48,850, while the twenty (20) high-debt nonprofit colleges ranged from $41,750 to $71,350. 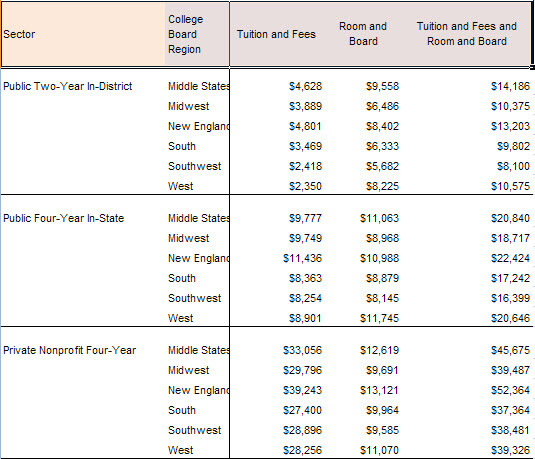 Of the twenty (20) low-debt colleges listed, nine were public and eleven (11) were nonprofit schools, with reported average debt levels ranging between $2,250 and $11,200. Let’s now congratulate the class of 2014. You now “enjoy” being the class with the most individual student debt in history. This comes at a time when job opportunities are at a minimum. From the experience my wife and I had with our three boys, I’m not surprised at the following chart. As you can see, those who wish to obtain a college degree are sometimes forced to secure loans due to the extremely high tuition, book and living expenses. 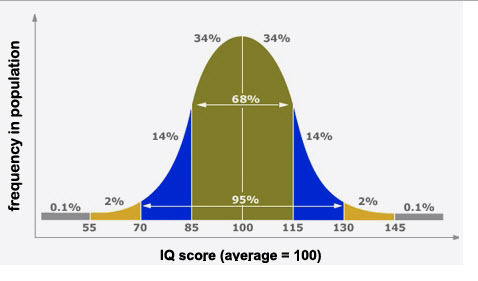 In looking at the graph below, we see that number approaching seventy percent (70%). The next one is really scary. Take a look. 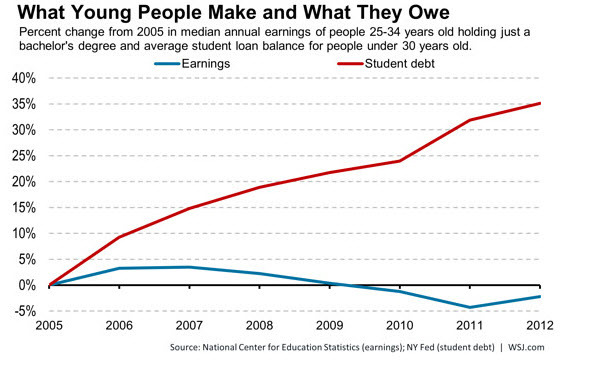 Student debt up approximately thirty-five percent (35%) and earned income down five percent (5%) from the year 2009. One individual, in business, has recognized the gravity relative to this issue—Mr. Mark Cuban. I honestly believe Mr. Cuban is correct. Our economy either improves with significant increases in individual earning power or great issues with student debt will create a situation where smaller less prestigious colleges and even universities will have to close. The drop in enrollment will be significant. We have already experienced that in our town with two four year colleges closing. OK, the big question. With the economy being in “the tank”, is a four year college degree worth it? Would it be better and with less stress to look at the “trades”? Plumber. The median salary for a plumber was $50,180 in 2013, the BLS reports. The best-paid pulled in about $86,120, while those in the bottom 10 percent earned $29,590 a year. Auto Mechanic. The median annual salary for mechanic and automotive technicians was $36,710 in 2013. The highest earners in the field made about $61,210, while the lowest-paid took home $20,920. Please don’t misunderstand, I have a four year degree in Engineering and love the profession. The university experience is wonderful and extremely rewarding, but maybe learning a trade and going to night school to obtain that four year degree is not such a bad idea after all. Even if it does mean an eight or ten year journey. If there is one thing I have learned in my seventy-two years: we have time. YES, there is time to do what you wish to do. You have to develop a plan, set realistic goals, stay focused and DO NOT GIVE UP. Hi, Neat post. There’s a problem along with your site in internet explorer, may check this… IE still is the market leader and a huge portion of folks will pass over your great writing due to this problem. Hello Dani. I really really try to post information that is value-added so my readers come away without feeling they waste their time. The “Student Loan Bubble” is very popular with my readers. Hope I’ve done that in your case. Take care. Hello loanemu. 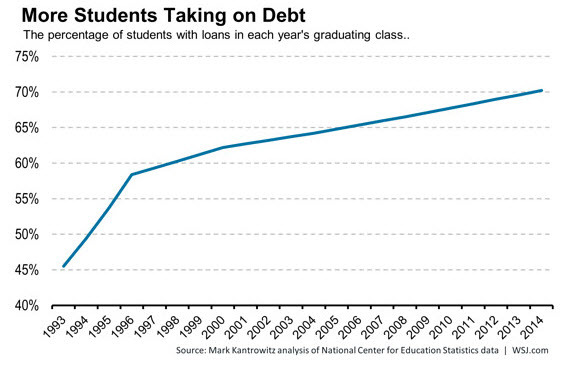 The “Student Loan Bubble” is very very popular. I think I hit a nerve with this one. Thank you so much for your very kind words. I am certainly happy you took a look and hope you will return. I’ve been writing for about five years now–hopefully getting better at it. Take care. B.
Hello Edgar. I used the template furnished by WordPress. I chose the fonts and all of the colors but the template is theirs. I definitely recommend you start blogging. It certainly has been beneficial to me. Thank you so much for your very kind words. I am certainly happy you took a look and hope you will return. I’ve been writing for about five years now–hopefully getting better at it. Take care. B.